No-carb “popcorn” that’s perfect for late night or middle of the day Netflix binging. Whip up a batch in less than 15 minutes and enjoy the crunchiness! Summer nights are better as movie nights. I don’t know about you, but there’s something so relaxing about snuggling up to a movie after a long day in the sun. If you’re like me and like snacks when you’re feasting your eyes on Matt Damon, following the yellow brick road, or urging Jack not to fall asleep, I’ve got an awesome keto-friendly movie snack for you! Originally, I was making these keto “popcorn” pieces for tops of salads and alongside meals when it dawned on me that it was literally the BEST and least expensive keto snack out there. So here we are! And! 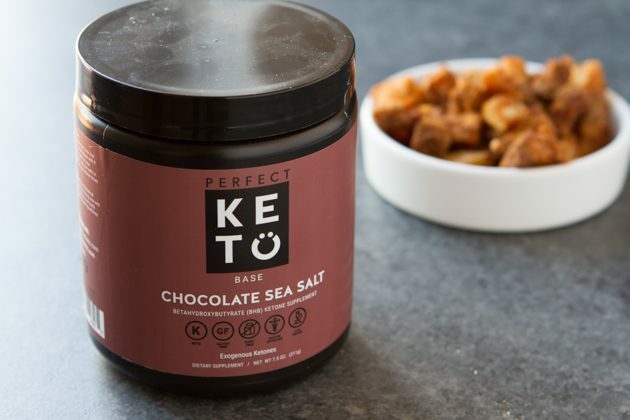 Because this recipe has A LOT of fat, making it a fat bomb that’ll boost your ketones to new heights (unlike the effects of popcorn), I thought it’d be worth mentioning that Perfect Keto, my favorite exogenous ketone supplement company, is offering 15% off your first purchase to ALL Healthful Pursuit readers with the coupon code HEALTHFUL. 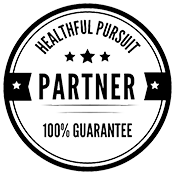 The first, my interview with Dr. Gustin on Perfect Keto and exogenous ketone supplementation. And the second, my (changed) thoughts of exogenous ketones after going on the book tour. Okay, here’s the FULL recipe. I went out for dinner with a friend and we ordered something similar to this and shared it as an appetizer. When Kevin and I got home, I quickly went to work to create the perfect copycat recipe. While I enjoy this keto popcorn with the sauce, if you want to go classic popcorn style, skip the sauce, add to a bowl and enjoy while watching your favorite movie! MACROS: Fat 70%, Carbs 0%, Protein 30%. Place coconut oil in a large pan set to medium-high. 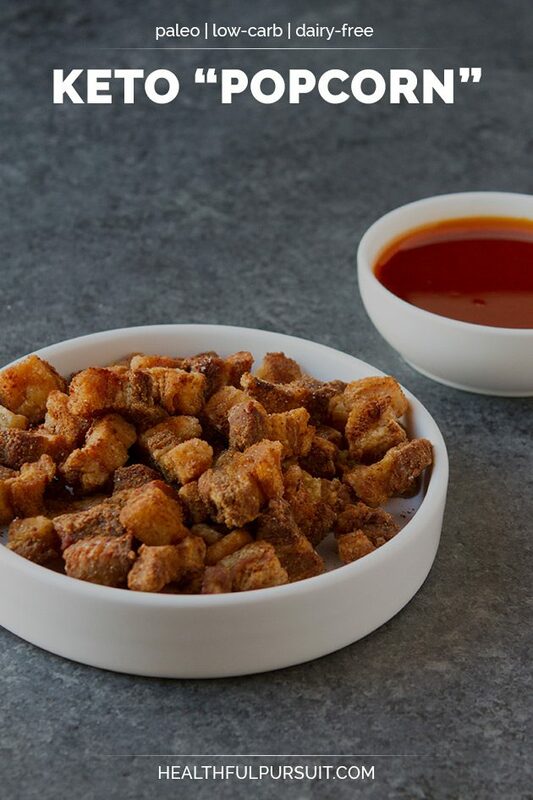 Toss the pork belly pieces in salt and five spice. 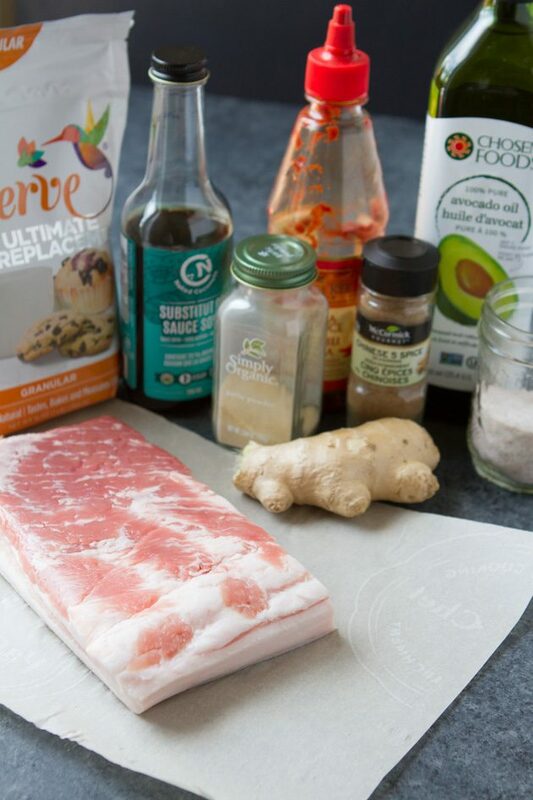 Once the coconut oil melts completely, add the pork belly pieces. Cover with a splashguard and cook for 20 minutes, rotating halfway through. Once complete, strain and reserve the fat for another day. Meanwhile, combine all of the sticky sauce ingredients in a small saucepan. Set on medium-low. Once boiling, keep going for 10 minutes. Whisking every 2 minutes. 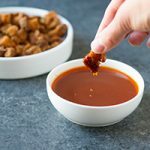 Transfer the sauce to a small serving bowl and serve alongside the keto popcorn. 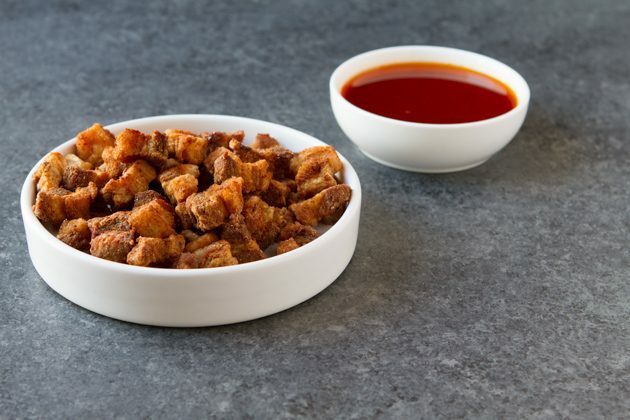 When looking for pork belly, it’s best to choose a cut that doesn’t include the skin. You can ask your butcher for what’s what. If you end up getting a cut with the skin, you can cut it off like you would chicken skin. It’s a bit harder to separate but worth it. I don’t enjoy keto popcorn with the skin on, I feel like it downgrades the flavor and makes it challenging to eat.